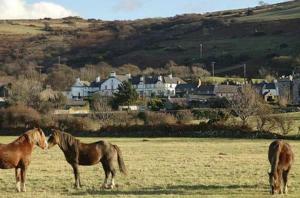 Choose from 32 hotels and guest houses in Gwynedd. Shown below a just a selection of the hotels available. To search within an area please use the menu on the right. Located on the open plain between Snowdonia and the Isle of Anglesey, this former farm has been transformed into a stylish country house. Ty'n Rhos is surrounded by 50 acres of farmland with views of Snowdonia, and its friendly staff extend a warm welcome. Bedrooms feature quality bedspreads and curtains, luxury bathrobes and towels, Egyptian cotton bedding, toiletries, courtesy trays and Freeview TV. There is a large, restful lounge furnished with antiques, and a cosy, tastefully furnished bar. The dining room and conservatory overlook the gardens and the Isle of Anglesey. Ty'n Rhos, which means 'house on the heath', has won many fine awards. In the pretty village of Menai Bridge, the 200-year-old Anglesey Arms is rich in original charm and traditional character, with en suite rooms, tasty home-cooked food and real ales. The Anglesey Arms is the first building you see as you enter the island of Anglesey over Thomas Telford's famous Menai Suspension Bridge over the Menai Strait. The friendly pub serves traditional real ales and good, honest pub food in a friendly, relaxed atmosphere. The building is steeped in history and the bell once used to call last orders was the original ships bell rescued from the HMS Conwy, which ran aground in the Menai Straits in April 1953. The en suite rooms feature modern comforts and facilities, including flat-screen TVs and tea/coffee. Free Wi-Fi is available in the bar. A full English breakfast is served each morning and free private parking is available on site. The A55 and the city of Bangor are just minutes away. Wales' highest rated country house hotel is a distinguished 17th century hall, set in 200 acres of parkland, with spectacular views of Snowdonia and Conwy Castle. Bodysgallen Hall and Spa has been restored and refurbished by Historic House Hotels Ltd in a traditional, elegant country house style with antique furniture, fine artworks and precious collectables, the hotel has the atmosphere of a private home. Buildings such as the farm, cottages, stables and coach house have been sympathetically modified to accommodate the spa, meeting rooms, guest accommodation and the recently opened restaurant, 1620. Believed to have 13th century origins as a watch tower to Conwy Castle, Bodysgallen Hall boasts beautiful private gardens and parkland for you to explore during your stay. They include a rare 17th century parterre of box hedges filled with sweet-scented herbs, a rockery with water cascade, a walled rose garden and several follies. The hotel is now part of the National Trust and all profits are donated to the charity. Carreg Mon is a family-run country hotel nestled in 3 acres of gardens located just 1 minute from the A55 and close to the Menai Straits. The hotel offers high standards of service, hospitality and cuisine. You can dine from the ? la carte menu in the restaurant, or choose a lighter meal from the bar menu. Morwendon House, meaning 'white wave of the sea' is situated in the quiet village of Llanaber and has beautiful panoramic views over Cardigan Bay. The high-quality, licensed guest house has free Wi-Fi and is an ideal base from which to explore and enjoy this beautiful part of Wales. 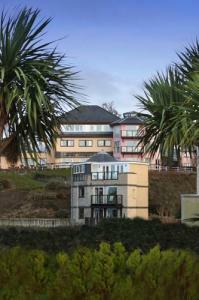 Morwendon House is set in 2.5 acres of lovely gardens and is a 5-minute stroll from the beach. Teresa and Geoff are your hosts at Morwendon and will ensure you have a relaxing and comfortable stay. Morwendon House is proud of its food and has AA awards for breakfast and dinner. Where possible, locally sourced, high-quality ingredients are used. Rich in original character and traditional charm, this beautifully preserved Grade II listed building offers good food, local welsh ales, 4-star guest accommodation and views over Caernarfon Bay. Y Beuno was reopened in 2007 after extensive refurbishment of the bar areas. It has been carefully and thoughtfully decorated, keeping many original features, such as the wooden floors, ceiling beams and a roaring open fire. Each luxurious and individually decorated en suite room has its own unique character. All rooms have TVs, DVD players, individually controlled heating and tea/coffee making facilities. Charming extras are included, such as homemade biscuits, bottled water, morning newspapers and luxury toiletries. The sea views of Caernarfon Bay from the front bedrooms are simply breathtaking. Fine dining has long been a tradition and the award-winning chef makes great use of the finest, freshest seasonal produce available locally, including crab, lobster and fish caught daily in Caernarfon Bay. Set within a beautiful Victorian residence, this charming hotel is the only accommodation in Porthmadog to be awarded a star rating by the AA and Visit Wales. The hotel is an ideal base from which to explore the natural beauty of the Cambrian Coast, the Llyn Peninsula, Snowdonia National Park and Anglesey. Royal Sportsman Hotel offers comfortable 3-star rooms alongside a restaurant, coffee lounge, bar, patio garden and private covered car park. The excellent restaurant has been awarded an AA rosette. As a family-friendly hotel, The Royal Sportsman can accommodate children of any age, from babies to teenagers. And, if you want to bring the whole family, the hotel will be happy to accept your pets (see Hotel Policies). All rooms have recently been refurbished. With a magnificent location, surrounded by the stunning natural beauty and dramatic scenery of the Snowdonia National Park, the Tynycornel Hotel looks out over its own 222-acre fishing lake. With the majestic mountains of Cader Idris reflected in its waters, Tal-y-Llyn Lake is more than a scenic asset; the hotel owns the lake, which is noted for its superb fishing. Tynycornel was a well-known fishing hostelry as early as 1800 and guests enjoy priority access to Tal-y-Llyn's prized waters, together with fine river fishing. Sensitively refurbished, Tynycornel is a solid, traditional building, rich in original character and traditional charm. The en suite rooms have splendid lakeside or garden views and guests can also stay in the adjacent accommodation, converted from old farm buildings. All rooms have TVs, telephones and tea/coffee making facilities. There is a spacious lounge overlooking the lake and the quiet bar and restaurant both offer a high standard of cuisine with an extensive wine list. 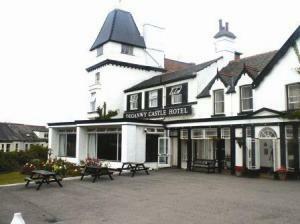 This family-run country hotel overlooks Harlech Castle and rests opposite the championship Royal St. David's golf course. The hotel is easily accessible by picturesque country roads off of all major motorways to the west. 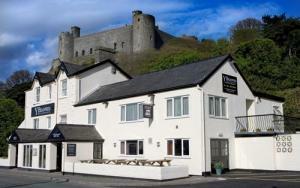 Overlooking by the ancient fortress of Harlech Castle, the refurbished Y Branwen Hotel offers comfortable double or twin bedrooms in pleasant surroundings. Guests can enjoy excellent amenities and superb food prepared by the resident experienced chef. In the brasserie, visitors can enjoy freshly prepared local produce, cooked to order. The menu is changed regularly and there is an excellent wine list. There is also a cosy wine bar plus lounge bar serving a wide range of keg and traditional cask ales, lagers, ciders and bottled beers. Within Caernarfon's ancient medieval town walls, this friendly guest house is within 200 metres of the Castle, the Menai Straits, the Marina and the Galeri Theatre. Tegfan Guest House offers rooms with central heating, digital TV, DVD players, tea/coffee and bottled water. Some rooms have en suite bathrooms. Fresh towels are provided daily and there is a selection of DVDs, books and magazines available. Close to the unspoilt beauty of Snowdonia, the guest house is only 200 metres from a very nice pub called the Anglesey Arms on the harbour front, which has spectacular views over the Menai Straits. Set on the banks of the magnificent Mawddach Estuary, this charming hotel is immersed within the spectacular scenery of the Cader Idris and Snowdonian mountain ranges. A haven of peace and tranquillity, George III is situated in the small hamlet of Penmaenpool which is 2.5 miles from Dolgellau and 9 miles from Barmouth. The surroundings are ideal for a host of country pursuits, including rambling, mountain biking, fishing and golfing. After a long day of exploring the area you can return to the George's welcoming restaurant, serving wonderful home-made food, prepared using the freshest local produce wherever possible. 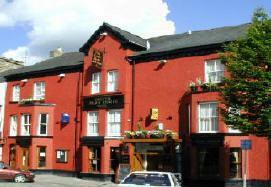 The Black Boy Inn is a 16th-century inn within Caernarfon's historic town walls and easy walking distance from the town centre and the famous 13th-century castle. The Black Boy dates back to 1522 and some of its walls are 1.2 to 1.5 metres thick. The wood panelling, low ceilings and thick wooden beams create a cosy atmosphere. Caernarfon is a market town with an open-air market every Saturday (Mondays also in summer). A haven of peace and tranquillity, this family run residence is immersed within 7 acres of private grounds on a secluded hillside setting, boasting spectacular views of Snowdonia's National Park. Overlooking the Vale of Glaslyn to some of the highest mountains in England and Wales, including Mount Snowdon, the area is well known for walking, climbing and mountain biking, as well as game fishing, cycling and golf, making staying here an ideal base for touring the area. In the evenings you can relax in the friendly atmosphere of the hotel's licensed restaurant. Serving a selection of freshly-cooked meals and a traditional Sunday lunch, the restaurant is popular with both residents and locals. This Premier Inn hotel is on Caernarfon Harbour, a 3-minute walk from the town centre, Caernarfon Castle, Segontium Roman fort and the Welsh Highland Railway (for trips into Snowdonia). 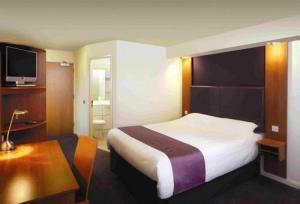 The Premier Inn Caernarfon is a hotel with comfortable en suite rooms and a Table Table restaurant. You can take the short trip over Britannia Bridge to Anglesey, for Pili Palas Nature World and Sea Zoo. Some rooms can take 2 adults and up to 2 children (under 16 years). The 2 children also get a free full breakfast when accompanied by an adult eating a full breakfast. The full all-you-can-eat breakfast has the expected cooked items, including vegetarian sausages, as well as a wide continental selection. Set within a beautiful Grade II listed building, dating back to the 17th century, this charming hotel boasts an idyllic setting in the village of Maentwrog, at the very heart of Snowdonia's National Park. Traditional, warm and comfortable, The Grapes Hotel is renowned for its home-cooked food, real ales and wonderful accommodation in North Wales. It provides the ideal base from which to enjoy a range of country pursuits, including walking, cycling and horse-riding. Each of the bedrooms at The Grapes has been recently refurbished to provide all modern comforts required for a comfortable and relaxing stay, whilst still retaining their original period features. Real log fires provide an inviting and cosy atmosphere for the cold winter evenings. On the banks of the Menai Strait and at the water's edge of Snowdonia, this hotel is halfway between Bangor and Caernarfon, equal distance from Isle Of Anglesey and Snowdonia. This hotel, graded 3 stars by the AA, has a licensed bar, a residents' quiet lounge, a breakfast room and a restaurant. Several restaurants are within walking distance. The hotel also boasts an indoor heated pool and sauna, and a large flat-screen TV in the bar. Hotel Plas Dinorwic is ideally located for exploring the varied attractions of the area, and for water-based activities. Snowdonia National Park is only a short drive away. Nearby you can experience excellent fishing, hill walking, mountaineering, horse riding, shooting, bird watching and much more. Seiont Manor sits peacefully within the countryside of Snowdonia, some of the most stunning scenery in North Wales. Surrounded by 150 acres of mature farmland, Seiont Manor offers a complete escape from the pressures of every day life. Imaginatively created from the original farmstead of a Georgian manor house, as soon as you walk in the door you'll receive a warm Welsh welcome that will instantly make you feel at home, ready to relax and recharge your batteries. Finding the space to unwind at Seiont Manor is not hard. You can escape for a long walk in the surrounding farmland, take in some fishing on the River Seiont within the hotel grounds, or burn off some excess energy in the 40ft Victorian pool or the gym. To enjoy life at a slightly more leisurely pace, you can absorb yourself in a good book in the library or lounge. Relaxation is effortless in the spacious guest rooms. Many rooms have been furnished with artifacts and antiques from around the world, making them unique and a real treasure trove of cultural finds. All rooms have either a small balcony or terrace to enable you to enjoy the view over the surrounding countryside, the herb gardens or the idyllic stream that trickles past one side of the hotel. The castle town of Caernarfon, university town of Bangor and Llanberis are only a 5 minute drive away. The Island of Angelesy is also reachable in just 10 minutes. 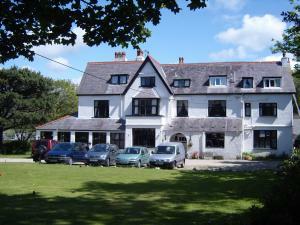 Royal Victoria Hotel is on the edge of the Snowdonia National Park and set within 30 acres of woodland. It offers breathtaking views and is a perfect base for exploring. Royal Victoria Hotel will welcome you with warmth and friendliness. It is popular with walkers wishing to explore Snowdonia. The Snowdon Mountain Railway is within 100 metres, and you can try rock climbing, abseiling, canoeing or pony trekking in the local area. Ideally situated for touring the Lleyn Peninsula and Snowdonia, this Victorian country house is set in one and a half acres of grounds, and is 5 minutes from the beach. Nefyn & District Golf Course is 5 minutes away and 6 other golf courses are nearby. Pwllheli Marina is a 10 minute drive away. Caeau Capel Hotel is the perfect base for a restful break, a business trip or sporting (golfing, sailing, walking) holiday. In the historical towm of Nefyn on the beautiful Lleyn Peninsula, Caeau Capel was built in the late 1800s as a country house for the Miller family whose daughter went on to marry the Prime Minister, Clement Atlee, who was a frequent visitor to the house. This listed building, originally a farmhouse dating from the 17th century, is now a hotel offering modern amenities whilst keeping its old world charm. Period features include oak beams and roaring log fires. We have an excellent reputation for food, with meals that use fresh local produce wherever possible are prepared by our experts chefs. Our extensive menu is served by friendly welcoming staff in a relaxed, informal atmosphere. The traditional bar is full of character and is popular with hotel residents and locals alike. Fine wines and real ales are served. We have a leisure complex with a heated indoor swimming pool, Finnish sauna and fully equipped gym. We are ideally situated in between the Victorian town of Llandudno and the historic walled town of Conwy with its famous castle. In the heart of Snowdonia National Park, this hotel has an excellent reputation for good food and wine and its popular grill bar overlooking the village and beyond. The Royal Goat Hotel is well placed for you to enjoy fine mountain scenery in Britain. 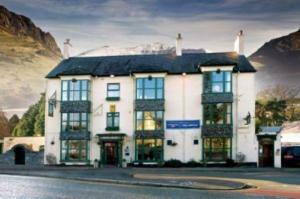 It is situated on the Porthmadog side of the village and residents' parking is available opposite the hotel entrance. In 15 acres of beautiful, peaceful countryside, on the edge of the Llyn Peninsula and Snowdonia National Park, The Stables offers charming 4-star guest accommodation and free parking. 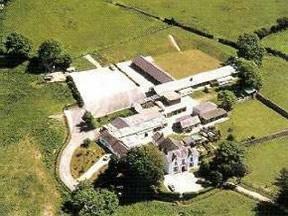 Originally built in the 1970s, The Stables has en suite ground-level rooms and 2 self-catering cottages. Each room is individually decorated, with its own charm. The Stables was once the home of the Olivers, a well-known local family of horse breeders. The breakfast room is in the original stable block, converted in the 1960s. With 15 acres of countryside and plenty of free parking, The Stables makes a great base for Snowdonia and North Wales, superb for walking, fishing, climbing and sailing. There are beaches within 2 miles (3.2 km) and Caernarfon is just 3 miles (5 km) away. Storage for bikes is available at The Stables. Originally built as a coaching inn in around 1780, the Plascoh Inn is now a family-run hotel, centrally located in the lovely Welsh town of Bala. The hotel offers free parking and comfortable, great-value accommodation. The regions major road network can be accessed easily. The hotel works closely with the National Whitewater Centre to offer guests discounted rates on the activities available: canoeing, kayaking, sailing, windsurfing on Lake Bala and white-water rafting. Guests can also enjoy special discounted rates on many of the other exciting activities on offer in the area, including golf, fishing and quad biking. The White Lion Royal Hotel, built 1752, reopened after extensive renovation to a 4 star Coaching Inn standard. Close to Snowdonia National Park (an area of outstanding natural beauty) and the Lake District of North Wales. 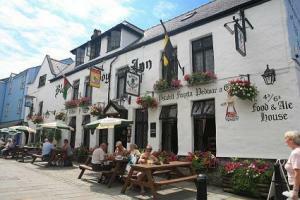 Straddling the A494 Dolgellau road, The White Lion Royal Hotel is ideally situated for touring North and Mid Wales. One would have difficulty finding a location as well situated as the Bala area, the Lake District of North Wales. The hotel has been completely refurbished, bringing it up to 4 star coaching inn standard. The White water rafting centre is nearby, we are one of the closest hotels. We would advise booking a table at the same time as room as restaurant is very popular. This historic 400-year-old country house is set in 15 acres of beautiful grounds and stunning scenery. It was once the home of Lord Snowdon and Princess Margaret. With log fires, sea and mountain views and individually styled bedrooms, Plas Dinas Country House is between the mountains of Snowdonia and the Irish Sea. Plas Dinas combines state-of-the-art amenities with antiques and a comfortable homely atmosphere. Good road links make Plas Dinas Country House accessible from many of North Wales's popular attractions. With stunning views of Cardigan Bay, this impressive Victorian building has a magnificent cliff-top location, between the sea and the mountains of the Snowdonia National Park. Originally built in the late 1880s for a famous gunmaker, Tyr Graig Castle was constructed to resemble both a castle and a double-barrelled shotgun. Today, the building has been converted to offer 4-star guest accommodation, but it still has beautiful original Victorian features, including stained glass windows, original wood panelling and decorative floors and ceilings. All of the en suite rooms have modern comforts and facilities, including TVs and DVD players. The lounge has a real log fire and drinks are available from the conservatory bar. There is also a terrace with superb views over the water. Overlooking Cardigan Bay, the restaurant offers traditional home-cooked British and Welsh food, made with the finest, freshest seasonal produce available locally. Set in countryside, this purpose-built 4-star, family-run guest accommodation is a haven for those seeking to discover the natural beauty of Snowdonia's mountains and coast. Offering all you need for an enjoyable stay, The Estuary boasts 10 en suite rooms, all of which are located on the ground floor and equipped with all common facilities. Located approximately 4 miles North of Harlech on the a 496, The Estuary is within reach of all major attractions, making it ideal for a relaxing or fun-packed break. The Estuary Lodge has a strict non-smoking policy. Guest reservations may be cancelled, with no refund of deposit, if guests are found to be smoking. In its several centuries of existence, this hotel has been a coaching inn, a farmhouse, and since 1968, a privately owned hotel. 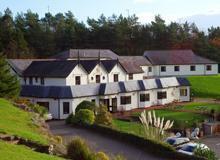 It is located off the A5 on the outskirts of the city of Bangor, in a region of outstanding natural beauty. It has the mountains, lakes and forests of Snowdonia National Park, as well as Gwynedd's dramatic coastline on its doorstep. Eleven en suite bedrooms feature digital TVs and free wireless internet. Boasting wonderful views over the Mawddach Estuary and the mountains beyond, this magnificent country house hotel stands in 20 acres of formal gardens, grounds and woodland. Set in the beautiful Snowdonia National Park and close to the market town of Dolgellau - where Mid Wales meets North Wales - this impressive hall was built in 1860 and has undergone careful restoration by the present owners, who have created a comfortable and welcoming hotel. This stylish hotel is perfect for chilling out and enjoying good food and wines or, if you want to be more energetic, there are a multitude of activities including mountain biking, fishing, walking, golf and pony trekking on offer. In Snowdonia National Park, set in over 5 acres of its own grounds, this luxury hotel has panoramic views in every direction and a newly refurbished AA Rosette-awarded restaurant. All of the hotel's spacious and comfortable rooms have beds with luxurious Egyptian cotton linen. A traditional full Welsh breakfast is included in the price. Dolserau Hall Hotel's 5 acres of immaculately kept gardens include a charming Victorian walled garden, which is a haven of peace and tranquillity. Amidst the glorious scenery of the Snowdonia National Park, just a couple of miles from the foot of Cader Idris Mountain, the hotel offers excellent food, attentive staff and thoughtful service.